In the first delivery of this series of posts, delivered for whom who are interested to understand the basics of MySQL Cluster "by examples", I wrote about installing MySQL Cluster with a python utility called ndb_setup-py, which offers a nice web graphical interface to define and start our brand new cluster. Let's get down to business and deal today with processes initialization; I will discuss about setting up a MySQL Cluster environment from scratch and step by step on a Linux machine. A cluster configuration file, usually named config.ini. This is unique for all cluster processes. The SQL node configuration file, usually named my.cnf. Must have one per SQL node. My favorite MySQL Cluster install method is using binaries, as to the purpose of learning how to install and administer a cluster it is not needed to install RPMs and their related scripts to start/stop a process as a service. Hence I recommend to download binaries by choosing "Linux - Generic" from related download page. Processes need to store stuff on the disk: not only to achieve durability, but also to store logs and other support files necessary to perform their duties. So every process will have a data directory. Plus, every process must define a nodeid, which is an integer number used to identify a process. Therefore, for simplicity, I recommend to create 4 folders under the desired path and name them with the nodeid I will set later in the configuration file. Important note: in order to make things easier, I will setup a whole cluster on my machine, while this is not the recommended topology in a real production environment, where data nodes and the management node should all run on dedicated hosts. Now that the four directories are created, let the fun begin! Before starting the management node for the first time, I need to setup a config.ini file. Let's use this bare simple one. We will use those folders we created as data directory. This output is telling that our 2 data nodes defined in the config.ini have not been started, but the management was started successfully. Finally, the SQL node is not connected, yet. We're done! Now that the cluster is up and running, we only need to connect through the SQL node and play! Remember that future data nodes restart, must be done without --initial option, otherwise data nodes data directories will be erased! And check your brand new cluster status! All processes declared as belonging to the cluster (topology was defined in the config.ini file) are now up and running, mission accomplished! Today I'll share a few slides I prepared last year for a presentation delivered at Oracle Open World. This is a quick and easy hands-on lab for fresh MySQL Server DBAs. I chose 5 among the most relevant topics when tuning and scaling a MySQL Server using InnoDB tables. Rate at which MySQL is delivering new features and improvements is impressive, in fact MySQL Server 8 boosts performance in many fields, especially regarding InnoDB REDO logging. Hence while the rest of recommendations still apply for new MySQL Server 8, the tuning REDO log flushing strategy is not mandatory anymore to achieve an improved throughput starting from MySQL 8. Improvements in such a field are mentioned by this blog post edited by Dimitri Kravtchuk, MySQL Performance Architect at Oracle MySQL (Twitter). For an overview of optimization techniques, I recommend having a look at official documentation. I have been playing with MySQL Cluster for some years now, and today I'd like to start writing a bit about it, how to set it up, configure, backup and also how to use it, as there's plenty of ways to drive operations towards the Cluster for brutal speed and concurrency. MySQL Cluster, the open source in memory database from Oracle MySQL, is available for free from MySQL Cluster download page (Community version has GPL license). But before starting with an overview of installation and setup, if you're new to MySQL Cluster, I would strongly recommend to have a look at this video. What I find more interesting about MySQL Cluster, is that it is possible to have a setup running on commodity hardware (the bare laptop), as it can be configured to have a minimum footprint in terms of memory and storage requirements. About high availability, MySQL Cluster offers unique features to resist any single failure (it has no single point of failure: that means any process, communication link or hardware component may crash/fail but the cluster will still be available) while offering a consistent view of data (synchronous replication between data node, a unique feature in MySQL databases). But.. what is MySQL Cluster? ndb_mgmd management process. A MySQL Cluster setup must have at least one (can have more, for redundancy). It is recommended to execute it on a host where ndbmtd processes are not running, but does not need to be on a dedicated host, though. It consumes little resources and act as arbitrator to rule out eventual split brain situations and serves a number of functions. ndbmtd data node process. Default configuration includes 2 data nodes processes, they implement the NDB (NDB stands for Network Database) storage engine and store data in memory. The recommendation is to execute one ndbmtd on its own host. Data nodes are replicated synchronously, hence any of these can crash and Cluster would survive and be serviceable. mysqld instances, aka SQL nodes. 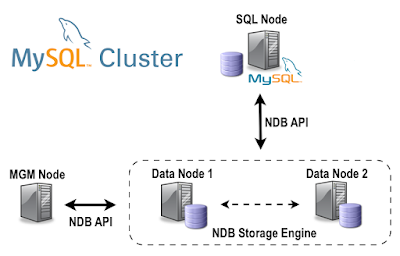 These are the classical MySQL Servers delivered with MySQL Cluster distribution (they differ from standard standalone distribution in that they are compiled to make use of NDB storage engine). They can be used to retrieve MySQL Cluster metrics, to execute SQL queries against the cluster (as we'll see this is not the only way to fetch data from it) and also are used to implement geographical replication (among other uses). SQL nodes can run on dedicated hosts but can also share host with data nodes or ndb_mgmd node. Best option is always away from a host running ndbmtd data nodes, as resources needed by SQL nodes can be variable depending on operations, then it's better not to add variable load to the host, which may affect data nodes performance (at least data nodes footprint is quite stable over time). Full detailed summary is available at official documentation page. How to install MySQL Cluster? There are two main distributions: the RPM/DEB package and the binary compressed package, I usually prefer to get the binary one, as it is more flexible and also easier to manage for new users. With binary distribution, everything is contained within a folder. 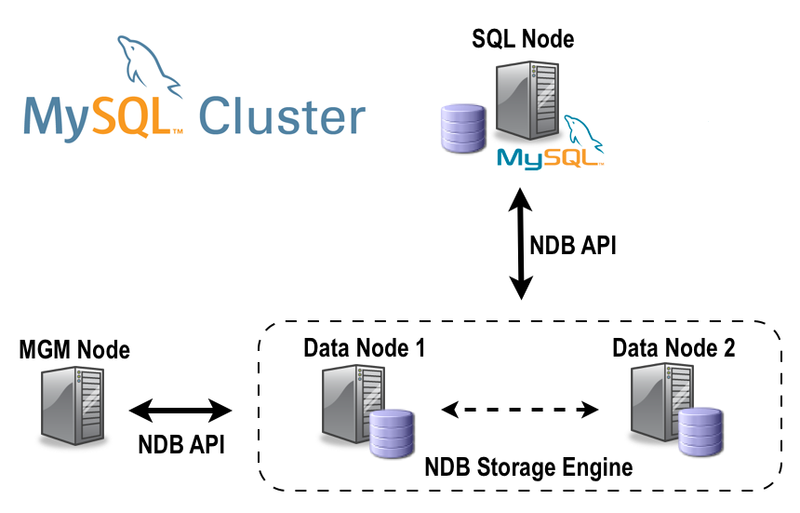 To get started quickly with MySQL Cluster, I would recommend to deploy a cluster on a single host using ndb_setup.py utility, available under the folder of binaries (bin). This command will open a graphical interface in a browser served by a minimalistic Python web server. It is really a simple tool and better suited to deploy all cluster processes at localhost (not the production recommended topology, but it's a good idea to start up quickly). This video shows a basic installation on multiple hosts (can be virtual machines as well). Pro MySQL NDB Cluster, written by Jesper Wisborg Krogh and Mikiya Okuno, Support Engineers at Oracle MySQL. The book contemplates the basics and much more to get started and administer a MySQL Cluster database. MySQL Cluster 7.5 Inside and Out, written by Mikael Ronstrom, NDB creator and Senior Architect at Oracle MySQL. It offers an in depth description of MySQL Cluster guts, together with the story of the product. In the next chapter, I will share some basic scripts to start the cluster from command line. Stay tuned! mortensi por www.mortensi.com se distribuye bajo una Licencia Creative Commons Atribución-NoComercial 4.0 Internacional.